And we're back! It's another Countdown to Geekmas and just like last year, you can expect 5 posts of geeky gift ideas a week, counting down to the big day. Whether you are a geek or you have a geek to shop for, I hope you can find something to help you as you plan your holiday shopping. Granted, mine is done (sorry, was that boasting? ;) but it doesn't mean that I didn't manage to find (and possibly even procure) some super nerdy finds for you and my lucky giftees. I'm super excited (as you can probably tell) so let's just get on with it!!! 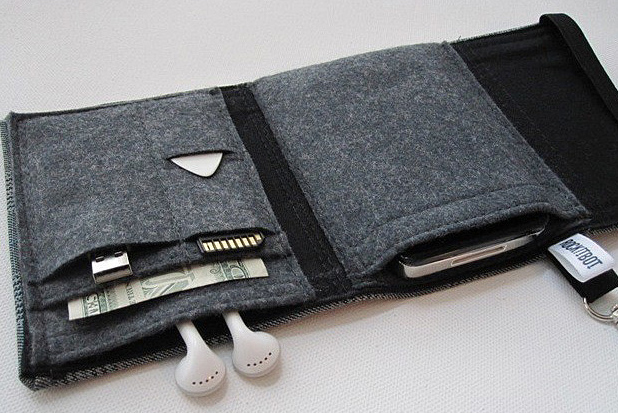 First up is a very kewl wallet for that gadget-loving geek in your life. Now, you might have noticed that when it's downtime, your favourite nerd might be hauling around way more luggage that s/he needs, especially if their usual tote is more oriented toward lugging such electronics as a tablet or laptop. Well, here's the perfect slimline alternative: the Nerd Herder Wallet. Please note this is a gadget wallet, and there are no zippered pouches for coins. This one almost made it under the tree for one of my giftees but we changed our minds at the last minute (i.e. once we received said giftee's actual wish list). Regardless, I was tempted to buy it and figure out who to give it to after the fact. This thing just reeks kewlness. Apparently, when these sell out, Uncommon Goods won't have any more until February. So if you're interested, you might want to move quickly on this one.